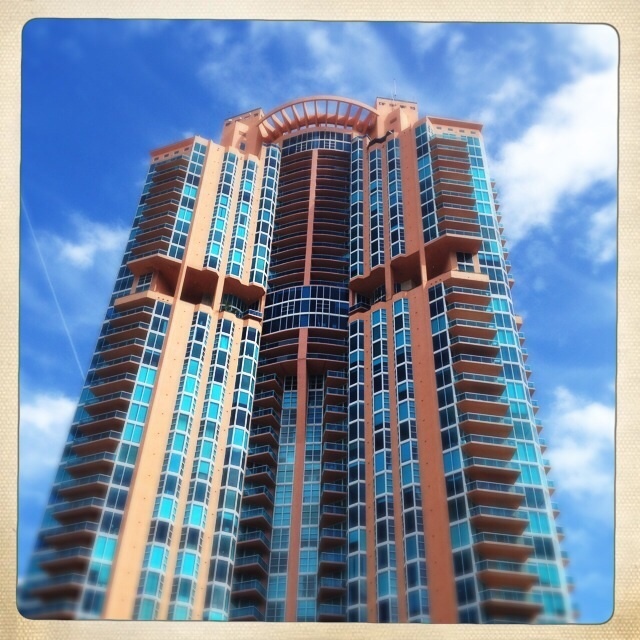 One of the tallest buildings in Miami Beach (and one of the most expensive places to live) is the Portofino. Even though it’s a tall skyscraper of a building, it still manages to look Art Deco in style. You can’t fail to miss the bright orange and blue building reaching into the sky. 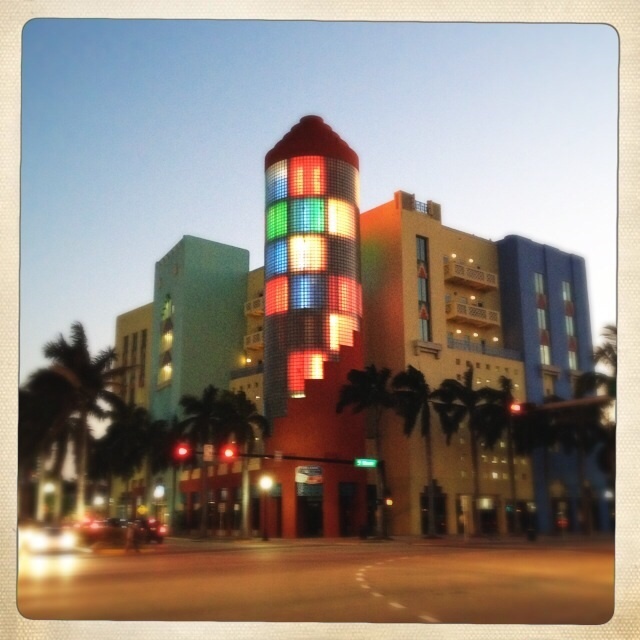 In the day the next building is nothing special but at night it comes alive with a spectacular light show. I think it really shows the architecture of the building better at night. 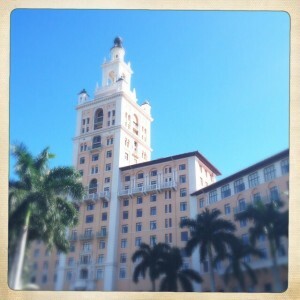 The next buildings are examples of some of the art deco hotels and buildings we have here in Miami Beach. The height restrictions are preserved in the art deco district so we’re lucky not to have high rise condos and hotels ruining the area. Picture a dreamlike setting complete with exquisite, hand-painted frescos on barrel-vaulted ceilings, brilliant travertine floors, fine marble columns, intricate leaded glass fixtures, carved mahogany furnishings and lavish gardens. 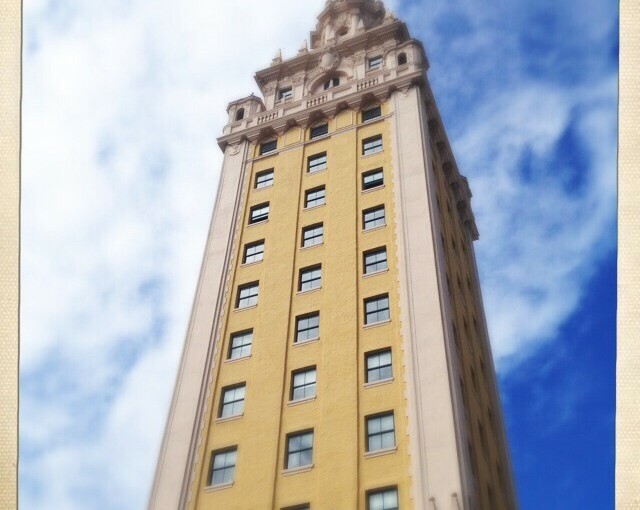 Then picture this all in the shadow of a spiraling Moorish Giralda tower. Is it a Spanish castle or a grand Venetian palazzo? Combining his deep affection for lush South Florida landscape with a high regard for Italian, Moorish and Spanish architectural influences, Merrick realized his dream in the construction of his masterpiece. The above buildings work really well in color but what happens when you turn them black and white. Which do you prefer?